With rates of stress and anxiety rising or perhaps just being more widely spoken about and accepted in society, how can we stay sane on a planet that is making us mad? How do we feel human in an increasingly technological world? And how do we stay happy in an over-anxious world? After experiencing years of anxiety and panic attacks, number one bestselling author, Matt Haig, sought answers to these questions, and began looking at the link between what he felt and the world around him hence why ‘Notes on a Nervous Planet’ was written. Working in social media in my day job and then managing multiple social accounts for my blog during my spare time, I can like Matt Haig find myself a little overwhelmed by social media at times. Over the weekend I did in fact take three days away from Instagram and Twitter and Facebook just for a little technology detox and it’s something I plan to do again on a more frequent basis. I am fully aware that I spend too much time on screens. That is also why me posting this blog post today is so important, everyone needs to remember you can take a break and you don’t need to be online 24/7. As you will have read in my latest post about the reality tv show/ social media experimentation ‘The Circle’ social media and technology are increasingly presenting us with issues that we just can’t ignore – the ‘beach body’ the pressure to be ‘perfect’, the need to ‘seek approval from others’. The impacts of social media on mental health are being more widely researched by scientists and more documented then ever before, its a subject that I feel extremely passionate about. Not only am I aware that the increasing amount of time I have to spend working on social media impacts me, but more importantly I’m concerned for the impact it will have on future generations especially any children I have in the future. These issues are discussed further by Matt in his beautifully honest book ‘Notes on a Nervous Planet‘ And recently I was delighted to learn that Matt just so happened to be visiting Guildford as part of the Guildford Book Festival for a talk in conversation with Katy Guest – the former Literary Editor of the Independent on Sunday followed by a Q&A session. So my sister-in law Laura and I decided to pop along to hear more from Matt on his views of how social media is changing our society and impacting our stress and anxiety levels…. Firstly though I’d like to introduce Matt a bit further for anyone who hasn’t read his work and explain why I personally find him so inspirational. Matt Haig is a number one best selling author writing in the fictional and non fictional genres for both adults and children. At 24 Matt suffered from severe anxiety and depression so much so he found it difficult to leave his house and had suicidal thoughts. He did however go on to write the best selling book ‘Reasons to stay alive‘ which journals his road to recovery and how he learnt how to live again. Why is he so inspirational? Matt writes with such honesty, warmth and humour about subjects that so many people are afraid to speak out about. Subjects that have so much stigma surrounding them even in this modern era. He lives with his mental health problems on a daily basis but he has survived them, unlike so many other literary heros in the past e.g Ernest Hemingway, there is a positive outcome from Matt’s battles. Lessons that we can all learn from. Most of all I admire Matt because in this modern world of 2018 Men are still discouraged from speaking out when they are having an emotionally difficult time, its seen as ‘weak’ for men to show their emotions or talk about their feelings. Matt goes against this and bravely shares his experiences to help others. 1 in 4 men will commit suicide and isn’t that something we should be ignoring, it’s something to talk about and not just brush aside. One of my favourite campaigns is the ‘Man Up‘ campaign – I strongly advise you to watch the video. Why do we tell men to stop crying, to harden up?!! In reality it takes guts to feel pain to show others how you feel, feeling pain is human its a strength not a weakness. Matt’s writing whether it be fictional or non fictional reminds us all how important it is to make the most of your time on earth. But what did I learn from listening to Matt Haig during a rainy autumnal evening in Guildford? Why not read on to learn more…. So is technology causing more problems than its solving? Are we addicted or disillusioned? Social media is slowly taking over our daily lives, how many of you find the first urge you have when waiting for a bus, sitting on a train or upon waking up is to reach for your phone? It’s an addiction produced the same way that addiction to gambling develops – the surprise, the uncertainty and the scarcity of a ‘reward’. Scrolling on your mobile phone is like playing roulette or pulling the lever of a slot machine, you don’t know what you are likely to see next. That addiction can take over and cause the breakdown in communication with those who are actually present in the room with you. I personally never use phones at dinner, but myself and my boyfriend are guilty of reaching for our phones first thing in the morning as opposed to talking to each other (a habit I wish I could break). Being on social media or concentrating on technology means that we as a generation can switch off and not actually engage. As I’m sure you realise this is damaging to our relationships, our mental health and our emotional wellbeing. A message through a phone can’t give you the same human touch or the vocal reassurance that being present with someone and actually talking and listening brings. During his talk in Guildford, Matt Haig discussed the study with rats and how the variable aspect of social media gets us hooked. This particular study examined a set up where rats push a lever to administer a reward, in some cases they press the lever and receive the reward whenever they want so subsequently they return when they fancy. But what happens when the rat presses the lever and doesn’t get a reward? It tries again and suddenly triggers a reward – so the reward in response to the action is now variable. The rat now loses it, continuing to press the lever again and again in an effort to be rewarded. But what’s the point of him talking about rats you wonder? Well the temptation to check your phone is a prime example of uncertainty thus why you are addicted. Has that person got back to your text? How did your photo update go down with everyone? What is your friend up to on holiday? Like the treats for rats ‘likes’ on social media have been scientifically proven to inject a bump of dopamine into human minds. Causing a rush of warmth ‘ahhh someone cares’. Of course, though social media is variable – we don’t always get the approval, thus the challenge and drive for love is what turns us into the rat aimlessly pawing at the lever for a buzz of pleasure. This need to be accepted on social media, to be respected and valued can take over everything if you aren’t careful. The uncertainty element of social media is never ending, so why not wait a bit before you rush to reach for your phone. Do we spend too much time on our phones? The pressure to feel like you always need to respond straight away is overwhelming, but it doesn’t need to be – follow mine and Matt’s advice and take a few days or even a few hours away from your phone. Trust me you will find it liberating. Do you have your phone beside you at all times? By your bed, in your pocket, on your desk?. Why not put it away or place it at the other side of the room. Our sleep patterns are heavily affected by the presence of phones by our bed it’s hard, but it’s worth trying to sleep without it beside you every now and again. Phones are made for multitasking, checking your emails, checking your social media feed, checking messages. But guess what the human brain isn’t, not even Women’s…. trying to do all of this increases stress levels – will the world end if you limit the amount of time you spend on your phone? No – I know shocking right. We should spend less time on screens and more time reading…. I’m worried. I’m worried that we will grow up in a world where it’s acceptable to sit at the dinner table behind a screen and not talk to each other. I see it more and more families out for dinner and the children sat with a ipad or phone as a way to keep them quiet, I hate it. It’s one of my biggest pet peeves and I refuse to let it happen when I have children – what’s so wrong with having a conversation….. Will playing games online become more important to the next generation then reading? I hope not. I studied English Literature at A level and as many of you know I almost choose it as a degree, I have the Bloody Chamber to blame for me changing my mind at the last minute. But I still read whenever I can, admittedly I have a Kindle now but I still have a few of my favourite books in paper back that I read from time to time. 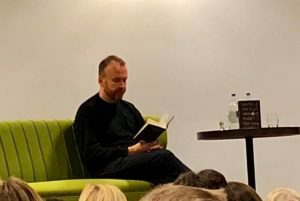 Reading is an escape from reality as Matt Haig discussed during his talk. As I discussed in my post on ‘The Circle’ I do feel technology is presenting an increasing pressure on ‘being perfect’ yes this has always been the case in society, but social media and technology just thrusts the issue on us in a more damaging way than ever before. 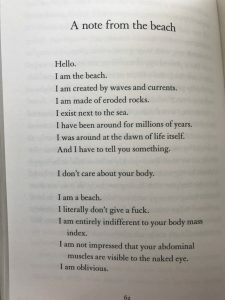 As Matt discusses in ‘Notes on a Nervous Planet’ increasingly advertising and marketing is targeted at the perfect beach body, this is something that working in marketing I am fully aware of. Sitting on social media at work I am surrounded by beautiful images of beach beauties, of model guys, ‘couples goals’ and it gets overwhelming. This fun take on the subject serves as a reminder to us all to be happy in ourselves, to stop comparing and to enjoy our bodies for what they are. We are all unique and loving yourself is one of the most vital things you can do for your physical and emotional wellbeing. He goes onto to say that other people don’t actually care what you look like as they are too self obsessed worrying about their own appearance and even if they are judging you, why do you care? Why are you seeking approval from other people? It’s not healthy you should just let it all wash over you, ‘Just be. Just Beach’. This pressure to be perfect, to look like an influencer is something I’ll admit I battle with, I’d love to be more toned but I’m also happy with how I am. We are expected to be skinny, to have perfect makeup, to have no acne. And I’m worried about that for the future, I don’t want to bring a daughter or a son for that matter into a world where it’s deemed you have to look a certain way to be happy, to be popular or to be accepted. With increasing numbers of young people suffering from eating disorders, isn’t it time we stopped photo shopping and we show men and woman in their natural state?! Stretch marks and acne galore. All this pressure to appear perfect is making everyone more insecure and anxious. I’ll be the first to stand up and say do you know what let’s all have make up free days, I can go days without wearing it and just accept that people will see me in my true state – acne scars and all. It’s time we all started sharing the flaws that make us human rather than airbrushing them out. Another key point that Matt discusses is that social media is like a brochure, a glossy, shiny version of your life. And in a brochure, you want to sell yourself, don’t you? It’s all part of the branding to appear perfect and gain popularity and hear it goes again the ‘reward’. In reality no one really posts about the fact they struggled to get out of bed for a whole day, that their mum died or that they hate their job, do they? (Well some people do…) So why is it when we ourselves are feeling down that scrolling through our newsfeeds and seeing these seemingly ‘perfect’ insights into other people’s lives affects the human mental capacity so badly. Matt does in fact suggest stepping away from social media if you are feeling down because it can be hard to recognise that the people online are only selling you what they want you to see. When I was a teen this was something I myself struggled with, seeing others in this idealistic happy relationship confused me – to be in love with someone do you have to post lovey dovey posts and status up dates? This is something which in fact still annoys me now, if I don’t post images of me and my boyfriend my friends or even some of my family assume something is wrong in our relationship, when in fact I’m just sick of the social media brochure lifestyle and like to keep some things private to myself. I also hate living my life through a screen, on occasion I will share a blog post that’s personal or post up images of my boyfriend, my friends or my family but that’s because it’s linked to a important story ,I feel will benefit others. Rather than because I seek approval or validation or want to show off. I don’t need to write about how awesome my friends are or how amazing the present my boyfriend gave me is and post it up for the world to see. TELLING the actual person means so much more to me… so don’t get me started on the sappy ‘I love you’ posts that float around. Next time you post something online just step back and think…. Why am I doing this? Are you posting to conform to the social media brochure lifestyle? There are of course massive benefits of social media and technology, you can stay in touch with friends and relatives so much easier than ever before. You can promote your opinions and share your stories more widely and you can create your own little corner of the internet. If you are suffering or struggling to cope in any way you can rest assured that someone out there online is feeling or has felt the same way, social media helps to remind us all that you are never alone. 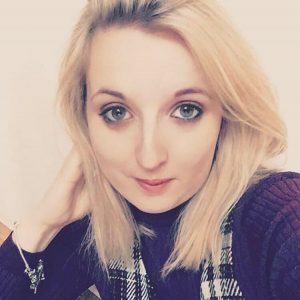 Working in marketing I do of course love the influence that social media affords you, I like the opportunity to be able to interact with people in real time and see direct results for my work. Instead of using social media to boast or attack others, why not use it as a force for good – suffering with acne tell others and help them, battling a eating disorder reach out to others for support, struggling to get out of bed each day – admit you need advice. The world of technology is meant to help us connect more, not disengage with each other so let’s use that to our advantage and make the world a better place, somewhere people feel they can share what makes them unique without feeling judged. Who knows how long social media will continue to dominate our lives, but with advancements in technology I can only assume it’s going to be around for a long time to come. So we really need to take time to understand it’s impacts and work together to develop a less nervous planet. I’d really recommend you having a read of Matt Haig’s ‘Notes on a Nervous Planet’ in fact if you fancy winning yourself a FREE copy head over to my twitter and take part in my giveaway (pinned tweet). 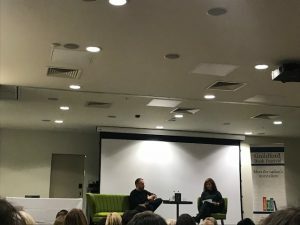 I’d also like to extend a BIG thank you to Matt Haig for his truly inspirational talk and for signing my copy of ‘Notes on a Nervous Planet.’ I was too nervous to say anything to you in person ,but I think you are great as you can probably tell by the fact I’ve dedicated a whole blog post to you! This blog isn’t sponsored and all views are my own. Please let me know your thoughts on social media in my comments below. As I mention in my Finding Happiness again series which casts a spotlight on depression, bullying, grief and Postpartum Depression if you find yourself struggling and can identify with any of the issues raised in my blogs please do speak out and seek help. Whether that be through a trusted friend,partner or a medical professional or charity. You must remember you aren’t alone and the emotions you are feeling are a human reaction not something to be ashamed of. So on point and appropriate for the world we live in today and all that we have to navigate. I’m just so glad there wasn’t social media when I was growing up, but it makes me anxious for my little girl and lord knows what she will face! Yes it’s so hard to know isn’t it what the future generation will face with technology. But Matt has written a super children’s book called the Truth Pixie maybe your daughter would enjoy it?